A favourite of the herbaceous border, achilleas, also known as yarrow, have undergone a beautiful transformation over the last few seasons, and are now available in an assortment of bright and vibrant colours. With attractive feathery foliage and an abundance of flattened flower heads held upon well-branched stems, the plants will form clumps of growth which will provide blooms for years to come. 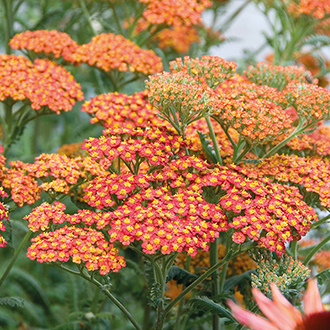 Whether grown for its perennial value of for its ability to attract beneficial insects into the garden, achillea is one of the best border plants available. Use to create blocks of summer-long colour in the middle of the border. Plant in full sun in well-drained soil. Fully hardy, perennial. Established 9cm potted plants supplied.